HAMILTON, Ohio -- As new businesses pop up in the city’s urban core, historic residential districts are seeing their own revitalization. The transformation is partly thanks to Hamilton-based nonprofit Consortium for Ongoing Reinvestment Efforts . The consortium, more commonly known as CORE, is partnering with homeowners to acquire and rehabilitate houses in the city’s three historic districts. “We wanted to address that the same way we were addressing empty buildings on Main Street,” said CORE executive director Mike Dingeldein. The organization operates under three different arms: an investment fund, strategic property fund and residential redevelopment fund. Residential redevelopment projects follow a four-step process. CORE representatives start out by acquiring a property. They stabilize it immediately following acquisition to ensure its roof, gutters, siding, doors and windows are weathertight. The organization then guts the building. Once the first three steps are complete, the nonprofit attracts owners and works with them to finish renovations. “If we did not have CORE ... we would not have been able to do this,” said Andy Weltzer, who along with fiancée Carrie Pate is partnering with CORE to rehabilitate a home in Hamilton’s German Village district. The 4,200-square-foot home will boast six bedrooms and four bathrooms when finished. The final product will be a stark contrast from the building Weltzer first toured. “It was completely gutted,” he said. Seeing the house stripped down to its studs fueled his optimism. Working with a gutted structure would be a lot of work, but it also meant they could install modern plumbing and wiring. “I was confident we could do it,” he said. They’ve restored the home with new electric, plumbing, heating, ventilation and air conditioning, drywall and lighting. They’re now restoring the house’s trim and woodwork. After that, they have to install mantels and stain windows and doors. Weltzer estimates that the process of restoring the home will have taken roughly two years by the time it’s complete. The broader process of revitalizing the historic districts is similarly drawn out. “It’s a slow, patient process,” Dingeldein said. CORE has completed five residential redevelopment projects over the past five years. The organization has at least four more on its docket. Although it’s been a driving force, CORE isn’t solely responsible for the home rehabilitations in the historic districts. Katie and David Wright, who are renovating a home on Dayton Lane, found out about the property from friends and purchased the publicly-owned home through an auction. They eventually hope to restore the home, built in 1870, “back to its original glory,” Katie Wright said. For now, the 6,000-square-foot house serves as an income property, with their own living space on the first floor and apartments on the second and third floors. They’ve been working on the home since May and are expecting to wrap up their current renovations by next summer. Like Weltzer and Pate, the Wrights have put considerable work into their home already. “We had to essentially start from top to bottom,” Katie Wright said. Renovations have included, among other things, repairing holes in the roof, replacing portions of ceiling, painting, carpeting, plumbing and drywall work, and installing new vanities and fixtures in bathrooms. With the exception of a few contracted projects, David Wright has done much of the work himself. While he still works on the house every day, he’s down to about 20 hours a week from the 70 he was putting in at first. 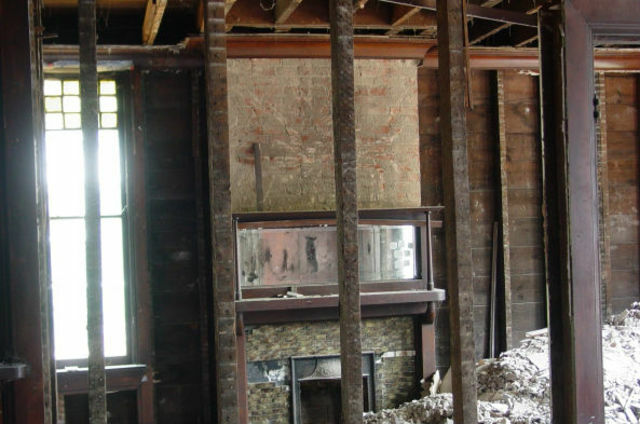 Whether rehabilitating a home independently or with assistance from an organization like CORE, time, money and unexpected challenges are common themes in renovating historic homes. “These old homes throw a lot of curveballs at you,” Weltzer said. Rot and decay are common hidden issues in older homes, he said. He also has run into challenges with load-bearing walls. The Wrights faced their own challenges. At one point, they had to jackhammer holes to access the home’s foundation to build support for walls. Despite the challenges, she wouldn’t dissuade anyone from taking a similar path.